He can also frustrate me to no end, but that’s a story for another time. He can be such a little old man in his eight year old body. He is trying to figure out who he is and where he is headed in our world, our community, but mostly right here in our very own house and family. With Mama and two big sisters and a female dog and cat, he and the Fella are outnumbered. My little guy can get overwrought sometimes–like when he wishes his sister would play with him instead of “her friends” *insert his eye roll here* or when he misses his oldest sister away at college or when I go too many days between serving foods from his favorite food group–the “beige” one–and he’s soooooo hungry. But sometimes he surprises me with his adaptability. Or agreeability. Often it’s a little of both, or it’s that he is trying to play it cool and doesn’t want me to know how much he likes what I’ve just said. Whatever it is, he has a new mantra. Very often a shrug is thrown in there for good measure. Instead of this being a sarcastic reply or the least bit flippant, he actually pauses in serious thought before he offers this answer. His tone carries a lilt of genuineness, with the emphasis on the ‘why not’ bit. As in well, sure, why wouldn’t I want to join you in the store, Mama? I can’t imagine anything I’d rather do than be with you as you tackle that list you forgot to bring with you. Again. Personalities are fascinating, aren’t they? I don’t know if they could be any more different. Still I think both responses serve them well. I’ve always loved our girl’s enthusiasm, and now I’m gaining a whole new appreciation for Cooter’s laid back vibe. 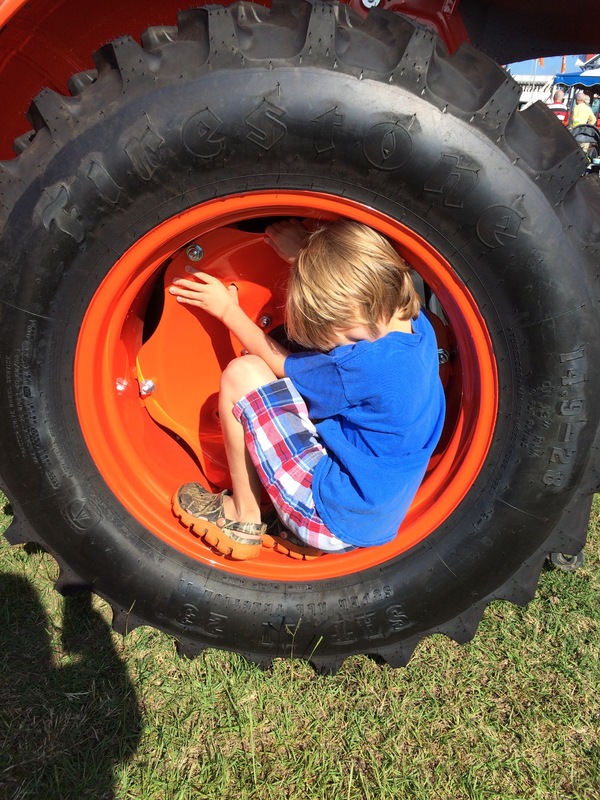 Cooter in a tractor tire? Yeah, sure. Why not?